If you enjoy a drink in a real old Victorian pub from time to time you would be interested to know that these splendid, bright and airy buildings were modelled on the gin palaces that preceded them. If you take a look outside they often have a date in the second half of the 1800s when they were rebuilt from the more earthy taverns they once were. Serving over a bar was also adopted from the gin palaces, which in turn had taken the practice from chemists where in earlier times gin was often dispensed. The first gin palaces appeared in the 1820s, and took their fashion from the new boutiques and shops of the time that introduced gas lights and sumptuous interiors. Charles Dickens spoke of them as “perfectly dazzling when contrasted with the darkness we have just left…”. There was also rarely anywhere to sit. You were expected to arrive and enjoy your drink, perhaps with a little sweet pastry or cake that was on also on offer and perch at the bar or one of the high tables around room. Tanqueray gin was first produced around this time in 1830 in Bloomsbury. 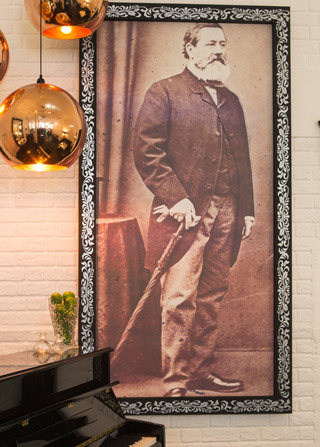 Diageo are now the pround proprietors and to commemorate Charles Tanqueray’s birthday they asked us and production specialists The Persuaders to create a 21st century gin palace. The design for the pop-up was an up to date version of those old palaces: ornate, well lit, spacious – with plenty of standing room. The palace was to be open on three consecutive evenings. The opening night was busy – press, Tanqueray clients and assorted London party folk. It was a lot of fun too. These Victorians may have been on to something in designing space to be sociable rather than having everyone parked at tables away from their neighbours. 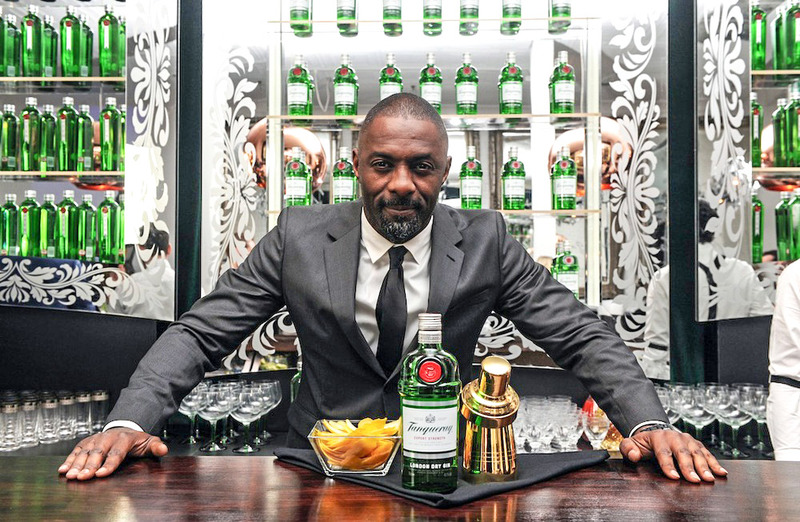 It helped too that we had our Tanqueray ambassador in attendance, none other than Idris Elba. Plus enough elegant celebrity to have our beautiful bar across the society and entertainment pages. The following nights were just as popular – queues outside and happy faces leaving after sampling some very special drinks.